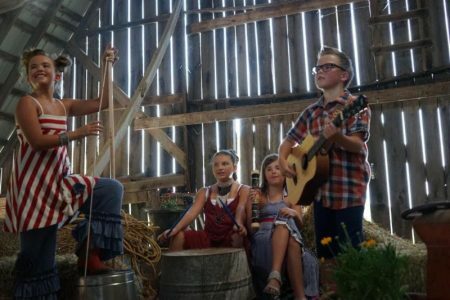 Young energetic country/pop sibling group, The Runaway Hamsters, recently announced the premiere of their official music video to their radio release, “A Little Country”. The video debuted on the Country Rebel Facebook page Thursday, October 6th. Twelve-year-old Isabella and her triplet ten-year-old siblings…Abby, Gabby and brother Riley combines touching lyrics with a dose of honesty and humor, connecting both new and classic country listeners to their sound. “A Little Country” is the title song off their second EP and was co-written with their producer and Grammy-nominated songwriter Kent Wells. This video is directed by three time Emmy award-winner Roman White (2009 MTV Music Video Award for Taylor Swift’s “You Belong With Me” and 2007 and 2008 Director of the Year) and was filmed in Nashville, Tennessee. Best known for their musical youth and huge hearts, The Runaway Hamsters create music that is original, engaging and heartfelt. They all love to write and help others and uses the hashtag #wehelpfriends. This started as simply forming a band, writing and recording a song for their good friend, a second grader, who had been diagnosed with brain cancer. Since then, they have performed from Nashville to LA, opened for Andy Grammer and even played the famous Bluebird Café. They recently wrapped up a performance at the Children’s Hospital in Los Angeles where they donated instruments and funds to the children at the hospital and became official Jr. Ambassadors. From Boise, Idaho, these kids have been featured on radio stations and in media outlets from coast to coast. For more information on The Runaway Hamsters visit their website and follow them on Facebook and Twitter.